Thanks to what I can only assume was a slight boo-boo on my local gamestore’s part, I received my copy of Lara Croft & the Temple of Osiris (Gold Edition) almost a week ahead of its official release date and ended up spending part of my weekend playing through the first few sections of the game in both single-player and 2-player co-op mode. Let’s start by talking about the Gold Edition, which I believe isn’t actually available for all platforms or in all countries. The European Playstation 4 edition contained a physical disc (the game is download-only in some regions), an artbook (which was a little smaller and shorter than expected), a map of the game’s Overworld (again, smaller than expected but printed on papyrus-like paper), a season pass (which I still need to activate), and a 3″ Lara Croft mini-figurine (cartoonish, cute, but deadly…and it looks great on my shelf!). Some photos of the Gold Edition items can be found below. The graphics aren’t really next-gen in a strict sense but I love the comic-book-style opening cinematic (screenshots can be found here) and think the art design teams have done a great job of getting Lara back into the tombs. And since the game is based in Egypt, it was hard for me not to get distracted by all the beautiful Egyptian art and artefacts that can be seen throughout the game (I died several times while trying to take screenshots for future editions of Arte-Factual). The character models are pretty sleek, the visual effects are stunning, and the dynamic weather conditions in the Overworld hub help add a certain atmosphere to the game. The game’s graphics may lack the realism and depth of TR: Definitive Edition but I think that actually works in this game’s favour. The emphasis in this game is on creating a fun arcade experience to be enjoyed with friends. Hyperrealistic graphics would, I feel, detract from that experience. No offence to Camilla Luddington…but I’m so glad Keeley Hawes came back for Temple of Osiris. While Camilla’s voice lends itself best to Tomb Raider 2013’s “coming of age” story, Keeley was the perfect choice for this light-hearted romp. Kudos to the other voice actors involved in this game, especially Dorian Lockett, who voices rival archaeologist Carter Bell and does a fantastic job of creating a friendly rivalry between him and Lara. If you thought Tomb Raider 2013 was largely void of puzzles, fear not. 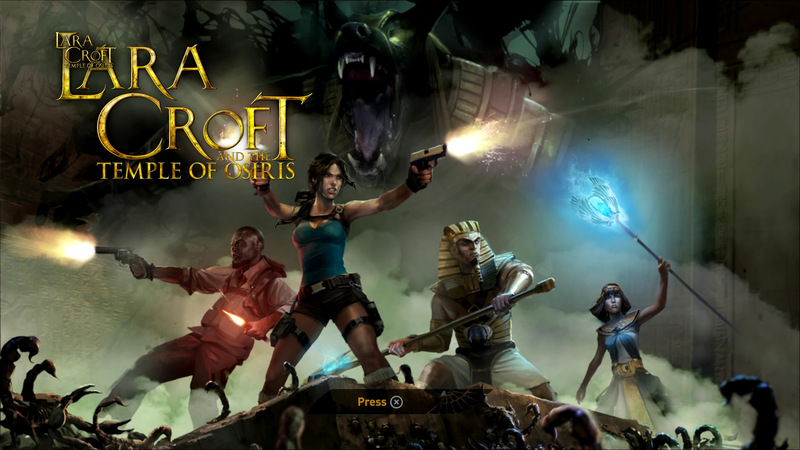 Lara Croft and the Temple of Osiris more than makes up for it! The pressure pads, timed runs, and moveable objects are back and some puzzles will have you scratching your head. Although the game is perfectly playable in single-player mode, some puzzles are a little easier to complete in co-op mode, especially if you’re as clumsy a gamer as I am. All in all, I’ve enjoyed playing Temple of Osiris so far and am looking forward to getting back to it as soon as I’ve published this. This is good ol’ arcade-gaming at its best, with a Tomb Raider twist. I’ve yet to get the hang of using the rings and amulets you collect throughout the game but, for the most part, it’s an easy enough game to get into and the first section of the game isn’t too taxing, especially if you’ve been watching the various demo playthroughs on Youtube. The game is best enjoyed in co-op mode so if anyone is interested in joining me in a co-op session one day, just let me know! Wait… Keeley Hawes is back for this! I just got too excited. This game needs to hurry up and get delivered. Puzzles! Glad to hear this is enjoyable so far. I should be able to start this tonight once it downloads on PSN. Thanks for posting so many screenshots! I really enjoyed Guardian of Light and can’t wait to jump in to Temple of Osiris with my girlfriend. It seems similar enough, like a puzzle-driven Diablo or something. That figurine is pretty rad as well!